When unique looking alligator shoes is what you seek and you like the style that no else has on their feet. Mezlan brand alligator shoes are what you need to wear. Mezlan is the brand these days that all the other shoe companies seem to copy with their sleek sharp looks. This is the Bernard which is an Italian style plain toe lace up shoe made of all over genuine alligator giving it a very appealing look. Hand made. Mezlan alligator shoes are simply the very best made in the World of alligator shoes. These are completely made by hand in very limited numbers by the very best shoe artisans that Mezlan employs. 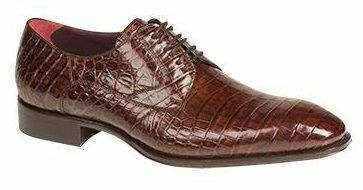 The men and women who make these fine alligator shoes must have many years of experience under their belt before they are even allowed to make these fine hand crafted reptile shoes. Many of these shoe artisans have been working with shoes for 30 years and know how to cut, carve and mold these fine men's alligator shoes into works of art.